New Haven-based funkmeisters Kung Fu co-headlined a mammoth show last week at the Highline Ballroom with up-and-coming jam band heroes Dopapod, with a set that proved the classic can be made new again. With both feet planted firmly in 70s funk-jazz fusion, Kung Fu’s high-energy, virtuosic set made us wonder how this music ever went out of style in the first place. Though still new on the scene as a band (their debut CD came out in 2011, the same year the band formed), the members of Kung Fu have a well-pedigreed history in jam circles with acts like The Breakfast, RAQ, Deep Banana Blackout and Jazz is Dead. As such, Kung Fu has already scored some high-profile opening act and festival gigs, including an appearance at this year’s Mountain Jam. Their modernized version of jazz funk has an eye toward today’s dance-friendly audiences; indeed, the glowstick twirlers seemed to dig this set without pining for Dopapod’s upcoming EDM flourishes. Kung Fu should have staying power in the scene for a long time. I recorded this set with Schoeps microphones in a mid-side configuration from the center of the balcony. After a good bit of editing – much more than usual – I am finally happy with the sound of this, but still note that the crowd on the balcony can heard at points, along with the general level of audience noise in the room. With that caveat, enjoy! 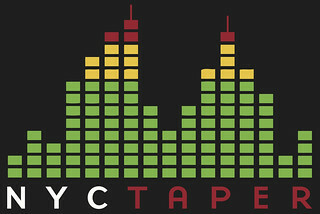 This NYCTaper recording is being hosted on the Live Music Archive. You can stream the entire show by clicking the song titles below. Note: All of the material on this site is offered with artist permission, free to fans, at our expense. The only thing we ask is that you download the material directly from the original source, rather than re-posting the direct links or the files on other sites without our permission. Please respect our request. If you enjoyed this recording, PLEASE SUPPORT Kung Fu, visit their website, and purchase their debut record from Amazon or your favorite retailer.